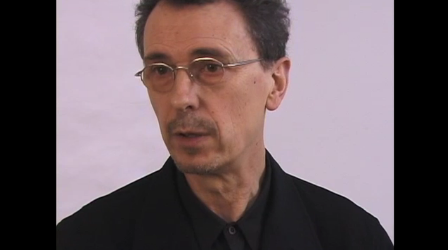 Victor Burgin (b.1941) is known as a highly influential artist and a renowned theorist of still and moving images. After 13 years in the United States, Burgin returned to live and work in his native Britain in 2001, taking up the prestigious post of Millard Professor of Fine Art at Goldsmiths College. Burgin first came to attention as a conceptual artist in the late 1960s and at that time was most noted for being a political photographer of the left, who would fuse photographs and words in the same picture. He has worked with photography and film, calling painting "the anachronistic daubing of woven fabrics with coloured mud". His work is influenced by theorists and philosophers such as Karl Marx, Sigmund Freud, Michel Foucault and Roland Barthes. From his beginnings as a painter, Burgin’s dissatisfaction with the lack of rigor in image-discourse led him to immerse himself in the semiotics, psychoanalysis, and other philosophical and political discourses. In this 2002 interview with Catsu Roberts, Victor Burgin discusses his continuing labor on the politics of representation, from his polemical photography in the 1970s to his theoretical and video work up to 2002’s Listen to Britain. Burgin discusses the theoretical and visual tracks of his work in changing British contexts. He also addresses the ‘painterly’ capabilities of contemporary digital media. "It's really about how you see the world and what screens what prisms you view the world through," he notes. "Narrative is one of them, narrative is everywhere... absolutely everywhere." A historical interview originally recorded in 2002 and re-edited in 2004. Produced in collaboration with Cornerhouse, Manchester, England.